1 A None No Power Seat 1 A is a standard Business Class seat located at a bulkhead that transforms to a fully flat bed. The bulkhead location of this seat provides the most privacy in the Business Class section. However, the close proximity of the galley area might be slightly bothersome. 1 C None No Power Seat 1 C is a standard Business Class seat located at a bulkhead that transforms to a fully flat bed. The bulkhead location of this seat provides the most privacy in the Business Class section. However, the close proximity of the galley area might be slightly bothersome. 1 D None No Power Seat 1 D is a standard Business Class seat located at a bulkhead that transforms to a fully flat bed. The bulkhead location of this seat provides the most privacy in the Business Class section. However, the close proximity of the galley area might be slightly bothersome. 1 G None No Power Seat 1 G is a standard Business Class seat located at a bulkhead that transforms to a fully flat bed. The bulkhead location of this seat provides the most privacy in the Business Class section. However, the close proximity of the galley area might be slightly bothersome. 1 H None No Power Seat 1 H is a standard Business Class seat located at a bulkhead that transforms to a fully flat bed. The bulkhead location of this seat provides the most privacy in the Business Class section. However, the close proximity of the galley area might be slightly bothersome. 1 K None No Power Seat 1 K is a standard Business Class seat located at a bulkhead that transforms to a fully flat bed. The bulkhead location of this seat provides the most privacy in the Business Class section. However, the close proximity of the galley area might be slightly bothersome. 12 A None No Power Seat 12 A is a a standard Premium Economy Class seat located at a bulkhead. There is no floor storage available for use during takeoff and landing. 12 C None No Power Seat 12 C is a a standard Premium Economy Class seat located at a bulkhead. There is no floor storage available for use during takeoff and landing. 12 D None No Power Seat 12 D is a a standard Premium Economy Class seat located at a bulkhead. There is no floor storage available for use during takeoff and landing. 12 E None No Power Seat 12 E is a a standard Premium Economy Class seat located at a bulkhead. There is no floor storage available for use during takeoff and landing. 12 G None No Power Seat 12 G is a a standard Premium Economy Class seat located at a bulkhead. There is no floor storage available for use during takeoff and landing. 12 H None No Power Seat 12 H is a a standard Premium Economy Class seat located at a bulkhead. There is no floor storage available for use during takeoff and landing. 12 K None No Power Seat 12 K is a a standard Premium Economy Class seat located at a bulkhead. There is no floor storage available for use during takeoff and landing. 16 A None No Power Seat 16 A is a standard Economy Class seat located at a bulkhead that features additional legroom. This seat and the one adjacent are ideal for couples traveling together. The tray table and the inflight entertainment monitor are installed in the armrest making the armrest immovable and slightly reducing seat width. There is no floor storage available for use during takeoff and landing. 16 B None No Power Seat 16 B is a standard Economy Class seat located at a bulkhead that features additional legroom. This seat and the one adjacent are ideal for couples traveling together. The tray table and the inflight entertainment monitor are installed in the armrest making the armrest immovable and slightly reducing seat width. There is no floor storage available for use during takeoff and landing. 16 D None No Power Seat 16 D is a standard Economy Class seat located at a bulkhead that features additional legroom. The tray table and the inflight entertainment monitor are installed in the armrest making the armrest immovable and slightly reducing seat width. There is no floor storage available for use during takeoff and landing. 16 E None No Power Seat 16 E is a standard Economy Class seat located at a bulkhead that features additional legroom. The tray table and the inflight entertainment monitor are installed in the armrest making the armrest immovable and slightly reducing seat width. There is no floor storage available for use during takeoff and landing. 16 G None No Power Seat 16 G is a standard Economy Class seat located at a bulkhead that features additional legroom. The tray table and the inflight entertainment monitor are installed in the armrest making the armrest immovable and slightly reducing seat width. There is no floor storage available for use during takeoff and landing. 16 J None No Power Seat 16 J is a standard Economy Class seat located at a bulkhead that features additional legroom. This seat and the one adjacent are ideal for couples traveling together. The tray table and the inflight entertainment monitor are installed in the armrest making the armrest immovable and slightly reducing seat width. There is no floor storage available for use during takeoff and landing. 16 K None No Power Seat 16 K is a standard Economy Class seat located at a bulkhead that features additional legroom. This seat and the one adjacent are ideal for couples traveling together. The tray table and the inflight entertainment monitor are installed in the armrest making the armrest immovable and slightly reducing seat width. There is no floor storage available for use during takeoff and landing. 18 C None No Power Seat 18 C is a standard Economy Class seat. The absence of a seat directly in front provides additional legroom. Please note that a passenger sitting in this seat might be bumped from crew and other passengers passing from the front of the aircraft. Also, the tray table and inflight entertainment monitor are installed in the armrest making the armrest immovable and slightly reducing seat width. There is no floor storage available for use during takeoff and landing. 18 H None No Power Seat 18 H is a standard Economy Class seat. The absence of a seat directly in front allows additional legroom. Please note that a passenger sitting in this seat might be bumped from crew and other passengers passing from the front of the aircraft. Also, the tray table and inflight entertainment monitor are installed in the armrest making the armrest immovable and slightly reducing seat width. There is no floor storage available for use during takeoff and landing. 2 A None No Power Seat 2 A is a standard Business Class seat that transforms to a fully flat bed. 2 C None No Power Seat 2 C is a standard Business Class seat that transforms to a fully flat bed. 2 D None No Power Seat 2 D is a standard Business Class seat that transforms to a fully flat bed. 2 G None No Power Seat 2 G is a standard Business Class seat that transforms to a fully flat bed. 2 H None No Power Seat 2 H is a standard Business Class seat that transforms to a fully flat bed. 2 K None No Power Seat 2 K is a standard Business Class seat that transforms to a fully flat bed. 26 A None No Power Seat 26 A is a standard Economy Class seat located in the last row of the section. Seat back recline might be limited due to the wall of the lavatory directly behind. The close proximity to the lavatory area might be bothersome. 26 B None No Power Seat 26 B is a standard Economy Class seat located in the last row of the section. Seat back recline might be limited due to the wall of the lavatory directly behind. The close proximity to the lavatory area might be bothersome. 26 C None No Power Seat 26 C is a standard Economy Class seat located in the last row of the section. Seat back recline might be limited due to the wall of the lavatory directly behind. The close proximity to the lavatory area might be bothersome. 26 D None No Power Seat 26 D is a standard Economy Class seat located in the last row of the section. Seat back recline might be limited due to the wall of the lavatory directly behind. The close proximity to the lavatory area might be bothersome. 26 E None No Power Seat 26 E is a standard Economy Class seat located in the last row of the section. Seat back recline might be limited due to the wall of the lavatory directly behind. The close proximity to the lavatory area might be bothersome. 26 G None No Power Seat 26 G is a standard Economy Class seat located in the last row of the section. Seat back recline might be limited due to the wall of the lavatory directly behind. The close proximity to the lavatory area might be bothersome. 26 H None No Power Seat 26 H is a standard Economy Class seat located in the last row of the section. Seat back recline might be limited due to the wall of the lavatory directly behind. The close proximity to the lavatory area might be bothersome. 26 J None No Power Seat 26 J is a standard Economy Class seat located in the last row of the section. Seat back recline might be limited due to the wall of the lavatory directly behind. The close proximity to the lavatory area might be bothersome. 26 K None No Power Seat 26 K is a standard Economy Class seat located in the last row of the section. Seat back recline might be limited due to the wall of the lavatory directly behind. The close proximity to the lavatory area might be bothersome. 27 B None No Power Seat 27 B is a standard Economy Class seat located in an Exit Row that features additional legroom. This seat and the one adjacent are ideal for couples traveling together. The tray table and the inflight entertainment monitor are installed in the armrest making the armrest immovable and slightly reducing seat width. There is no floor storage available for use during takeoff and landing. The proximity to the lavatory area might be bothersome. 27 C None No Power Seat 27 C is a standard Economy Class seat located in an Exit Row that features additional legroom. This seat and the one adjacent are ideal for couples traveling together. The tray table and the inflight entertainment monitor are installed in the armrest making the armrest immovable and slightly reducing seat width. There is no floor storage available for use during takeoff and landing. The proximity to the lavatory area might be bothersome. 27 D None No Power Seat 27 D is a standard Economy Class seat located at a bulkhead. The tray table and the inflight entertainment monitor are installed in the armrest making the armrest immovable and slightly reducing seat width. There is no floor storage available for use during takeoff and landing. The close proximity to the lavatory area might be bothersome. 27 E None No Power Seat 27 E is a standard Economy Class seat located at a bulkhead. The tray table and the inflight entertainment monitor are installed in the armrest making the armrest immovable and slightly reducing seat width. There is no floor storage available for use during takeoff and landing. The close proximity to the lavatory area might be bothersome. 27 G None No Power Seat 27 G is a standard Economy Class seat located at a bulkhead. The tray table and the inflight entertainment monitor are installed in the armrest making the armrest immovable and slightly reducing seat width. There is no floor storage available for use during takeoff and landing. The close proximity to the lavatory area might be bothersome. 27 H None No Power Seat 27 H is a standard Economy Class seat located in an Exit Row that features additional legroom. This seat and the one adjacent are ideal for couples traveling together. The tray table and the inflight entertainment monitor are installed in the armrest making the armrest immovable and slightly reducing seat width. There is no floor storage available for use during takeoff and landing. The proximity to the lavatory area might be bothersome. 27 J None No Power Seat 27 J is a standard Economy Class seat located in an Exit Row that features additional legroom. This seat and the one adjacent are ideal for couples traveling together. The tray table and the inflight entertainment monitor are installed in the armrest making the armrest immovable and slightly reducing seat width. There is no floor storage available for use during takeoff and landing. The proximity to the lavatory area might be bothersome. 28 A None No Power Seat 28 A is a standard Economy Class seat. The lack of a seat directly in front provides additional legroom. The tray table and the inflight entertainment monitor are installed in the armrest making the armrest immovable and slightly reducing seat width. 28 K None No Power Seat 28 K is a standard Economy Class seat. The lack of a seat directly in front provides additional legroom. The tray table and the inflight entertainment monitor are installed in the armrest making the armrest immovable and slightly reducing seat width. 3 A None No Power Seat 3 A is a standard Business Class seat that transforms to a fully flat bed. 3 C None No Power Seat 3 C is a standard Business Class seat that transforms to a fully flat bed. 3 D None No Power Seat 3 D is a standard Business Class seat that transforms to a fully flat bed. 3 G None No Power Seat 3 G is a standard Business Class seat that transforms to a fully flat bed. 3 H None No Power Seat 3 H is a standard Business Class seat that transforms to a fully flat bed. 3 K None No Power Seat 3 K is a standard Business Class seat that transforms to a fully flat bed. 4 A None No Power Seat 4 A is a standard Business Class seat that transforms to a fully flat bed. 4 C None No Power Seat 4 C is a standard Business Class seat that transforms to a fully flat bed. 4 D None No Power Seat 4 D is a standard Business Class seat that transforms to a fully flat bed. 4 G None No Power Seat 4 G is a standard Business Class seat that transforms to a fully flat bed. 4 H None No Power Seat 4 H is a standard Business Class seat that transforms to a fully flat bed. 4 K None No Power Seat 4 K is a standard Business Class seat that transforms to a fully flat bed. 41 A None No Power Seat 41 A is a standard Economy Class seat located in the last row of the aircraft. Seat back recline might be limited. The close proximity to the galley and lavatory area might be bothersome. 41 B None No Power Seat 41 B is a standard Economy Class seat located in the last row of the aircraft. Seat back recline might be limited. The close proximity to the galley and lavatory area might be bothersome. 41 C None No Power Seat 41 C is a standard Economy Class seat located in the last row of the aircraft. Seat back recline might be limited. The close proximity to the galley and lavatory area might be bothersome. 41 D None No Power Seat 41 D is a standard Economy Class seat. The close proximity to the galley and lavatory area might be bothersome. 41 G None No Power Seat 41 G is a standard Economy Class seat. The close proximity to the galley and lavatory area might be bothersome. 41 H None No Power Seat 41 H is a standard Economy Class seat located in the last row of the aircraft. Seat back recline might be limited. The close proximity to the galley and lavatory area might be bothersome. 41 J None No Power Seat 41 J is a standard Economy Class seat located in the last row of the aircraft. Seat back recline might be limited. The close proximity to the galley and lavatory area might be bothersome. 41 K None No Power Seat 41 K is a standard Economy Class seat located in the last row of the aircraft. Seat back recline might be limited. The close proximity to the galley and lavatory area might be bothersome. 42 D None No Power Seat 42 D is a standard Economy Class seat located in the last row of the aircraft. Seat back recline might be limited. The close proximity to the galley and lavatory area might be bothersome. 42 E None No Power Seat 42 E is a standard Economy Class seat located in the last row of the aircraft. Seat back recline might be limited. The close proximity to the galley and lavatory area might be bothersome. 42 G None No Power Seat 42 G is a standard Economy Class seat located in the last row of the aircraft. Seat back recline might be limited. The close proximity to the galley and lavatory area might be bothersome. 5 A None No Power Seat 5 A is a standard Business Class seat that transforms to a fully flat bed. 5 C None No Power Seat 5 C is a standard Business Class seat that transforms to a fully flat bed. 5 D None No Power Seat 5 D is a standard Business Class seat that transforms to a fully flat bed. 5 G None No Power Seat 5 G is a standard Business Class seat that transforms to a fully flat bed. 5 H None No Power Seat 5 H is a standard Business Class seat that transforms to a fully flat bed. 5 K None No Power Seat 5 K is a standard Business Class seat that transforms to a fully flat bed. 6 A None No Power Seat 6 A is a standard Business Class seat that transforms to a fully flat bed. The close proximity to the galley, lavatory, and self-service refreshment area might be bothersome. 6 C None No Power Seat 6 C is a standard Business Class seat that transforms to a fully flat bed. The close proximity to the galley, lavatory, and self-service refreshment area might be bothersome. 6 D None No Power Seat 6 D is a standard Business Class seat that transforms to a fully flat bed. The close proximity to the galley, lavatory, and self-service refreshment area might be bothersome. 6 G None No Power Seat 6 G is a standard Business Class seat that transforms to a fully flat bed. The close proximity to the galley, lavatory, and self-service refreshment area might be bothersome. 6 H None No Power Seat 6 H is a standard Business Class seat that transforms to a fully flat bed. The close proximity to the galley, lavatory, and self-service refreshment area might be bothersome. 6 K None No Power Seat 6 K is a standard Business Class seat that transforms to a fully flat bed. The close proximity to the galley, lavatory, and self-service refreshment area might be bothersome. 7 A None No Power Seat 7 A is a standard Business Class seat located at a bulkhead that transforms to a fully flat bed. The close proximity to the galley, lavatory, and self-service refreshment area might be bothersome. 7 C None No Power Seat 7 C is a standard Business Class seat located at a bulkhead that transforms to a fully flat bed. The close proximity to the galley, lavatory, and self-service refreshment area might be bothersome. 7 D None No Power Seat 7 D is a standard Business Class seat located at a bulkhead that transforms to a fully flat bed. The close proximity to the galley, lavatory, and self-service refreshment area might be bothersome. 7 G None No Power Seat 7 G is a standard Business Class seat located at a bulkhead that transforms to a fully flat bed. The close proximity to the galley, lavatory, and self-service refreshment area might be bothersome. 7 H None No Power Seat 7 H is a standard Business Class seat located at a bulkhead that transforms to a fully flat bed. The close proximity to the galley, lavatory, and self-service refreshment area might be bothersome. 7 K None No Power Seat 7 K is a standard Business Class seat located at a bulkhead that transforms to a fully flat bed. The close proximity to the galley, lavatory, and self-service refreshment area might be bothersome. 8 A None No Power Seat 8 A is a standard Business Class seat that transforms to a fully flat bed. 8 C None No Power Seat 8 C is a standard Business Class seat that transforms to a fully flat bed. 8 D None No Power Seat 8 D is a standard Business Class seat that transforms to a fully flat bed. 8 G None No Power Seat 8 G is a standard Business Class seat that transforms to a fully flat bed. 8 H None No Power Seat 8 H is a standard Business Class seat that transforms to a fully flat bed. 8 K None No Power Seat 8 K is a standard Business Class seat that transforms to a fully flat bed. Lufthansa's music entertainment program includes listings for several CD's, radio stations, and audio books. Additional information about onboard entertainment may be accessed by clicking here. Lufthansa's video entertainment program includes an extensive listing of films, television programs, children's programs, documentaries, and games. Live TV channels CNN, Euronews, and Sport 24 may be also be accessed free of charge via the seat back screen or on your own device by accessing the FlyNet Wi-Fi portal. Additional information about onboard entertainment may be accessed by clicking here. All Business and Premium Economy class seats are equipped with both 110V AC power ports and USB power. FlyNet is Lufthansa's inflight Wi-Fi service. Access is provided once the aircraft has reached cruising altitude. Several time and price packages are available. Additional informaiton may be accessed by clicking here. Full meal and beverage service is available on Lufthansa's long-haul flights. Additional information regarding selections available may be accessed by clicking here. Lufthansa's Airbus A350-900 aircraft is, as the airline has stated, "one of the most technologically advanced and environmentally-friendly long-haul commercial aircraft in the world." It offers comfortable spaciousness with its wide-body and larger windows to enhance the visual experience. The A350 aircraft series is also one of the most environmentally friendly. The aircraft structure is made of lightweight carbon fiber reinforced plastic, therefore, it uses 25 percent less fuel and produces 25 percent less fewer environmental damaging emissions. The A350-900's that Lufthansa operate feature three classes of service onboard - Business, Premium Economy, and Economy. Business Class features spacious seats that transform into fully flat beds. Also in Business Class, Lufthansa has created the Self-Service Refreshment Center which provides passengers with access to snacks and beverages. Premium Economy Class features wide comfortable seats with additional legroom. Economy Class features new ergonomically designed seating to make long-haul flights comfortable. Front row of the second business class cabin. Booked via a travel agent so virtually all the seat choices were gone by the time the airline invited seat selection. Was a touch apprehensive given the yellow seat review but in fairness to Lufthansa they had designed the seats on enough of an angle to blunt the effects of the galley and the table as your aspect was at the bulkhead. The food was decent, wine choices better but what really stood out was the staff service ethic. They enjoy what they do and it shows, new planes, professional food and flying the quickest turnaround Dublin to Singapore (40 minutes Munich) make this a go to choice. Only downside is seat could be a little wider but more than compensated elsewhere. On my opinion, the best seat on a new A350. Last row of business class, with only one row in front of it, and bulkhead behind. The only inconvenience is an aisle access. Monitor is large and adjustable, seat itself is comfortable and has lots of controls. Noise cancelling headphones provided are too large to sleep in, and the aircraft is VERY loud. Service is excellent, as always, and lounges are great. I've made the MUC - YVR flight three times this year, and I always choose this seat. There is one USB power outlet at least at row 16, I think at all Economy Seats, located on the monitor. The whole row 16 should either be green or at least green/yellow. The legroom is even more than in Premium Economy. They make you pay around 80 Euro for having this seat but as a tall person it is worth it. Please change the color, this seat is amazing. Granted, it is a little annoying not to be able to change the position of your armrest and having to stow your monitor for takeoff and landing, but hey, you can sit at a window and do not have to wake up your neighbor in order to go to the lavatory! This is very rare in Economy Class! I think 16K(A) should be at least green/yellow. Yes, table and monitor are in the armrest, but there is plenty of space to stretch legs. For me the best place in the house (in Eco of course). Would take it always again. Economy Seats on A350-900 are pretty nice. Warning about middle seating rows 37-40. There is no over head storage!!! Overall, seats 8DG are very good. The larger video monitor is a nice addition to the standard Lufthansa Business Class seat, and both seats being angled inward make the armrest area larger, and provide a bit more privacy if you happen to be traveling alone (compared to the side seat pairs.) However, there is only a thin partition and curtains separating this smaller business cabin and the premium economy cabin, so there can be more noise and light than in other parts of the business cabin. Standard new Lufthansa business class seat. Good length, good controls though slightly delayed response of the touchpad. Noise cancelling headphones attached to the seat, but they are bulky and very uncomfortable to sleep in (the reason I bought business class). The aircraft feels extremely cramped and very noisy, at least in comparison to B787. Business class gives you no privacy, and if you are traveling alone, can be bothersome for you or your seat neighbor. Configuration is 2-2-2. Large screen, moves in two directions. Outside camera feature is nice. 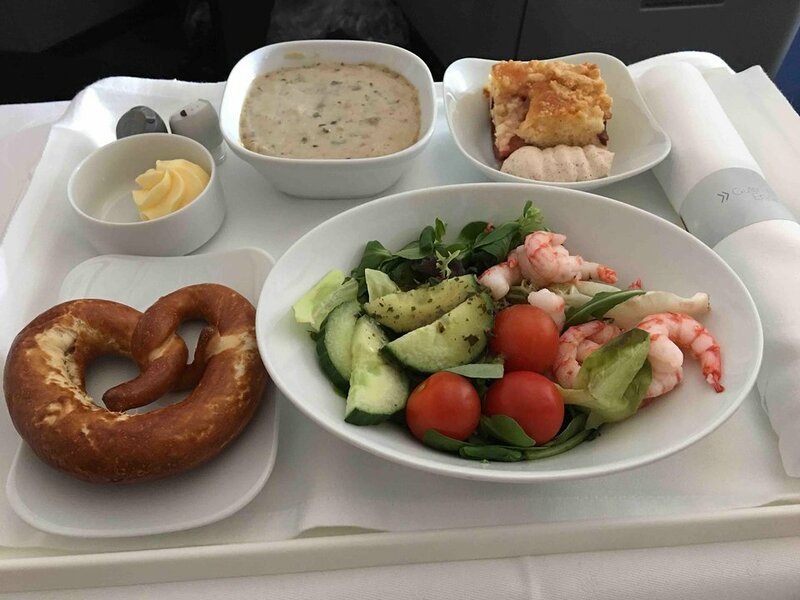 Service is impeccable as always on Lufthansa flights, however the food in business class on MUC - YVR leg was very mediocre, which came as a surprise to me. I've traveled Lufthansa Business and First previously, and they always held highest standards in Europe. Their service and food was better than Swiss or BA for example. So, that was a bit of a disappointment. Entertainment is ok, nothing to write home about. Generally, I don't think I'd pay again for business class on this aircraft, and in general will try to avoid it altogether. Unfortunately, Lufthansa changed A330 to A350 on this route, so I will have to choose another airline. Seats 1A and 1K are excellent seats concerning privacy, traffic on the aisles is limited to flight attendants - no restrooms in the front section. The noise from the galleys is tolerable, the actual galley is a bit further away from the seat as some storage / bulkhead is in front of the middle seats. One minor caveat though: essentially no overhead space for seats 1A and 1B exist due to the configuration of the bins; all luggage goes above row 2. Last row of business class. Booked it to avoid horrifying economy seats on a new A350 for a 10.5 hour flight (MUC - YVR) The seat itself is ok, with lots of controls. Though the aircraft itself is very noisy, and the seat is pretty narrow for business class. Definitely prefer the B787 any day. Will avoid this aircraft in the future. Beautiful aircraft, a lot of legroom in rows behind premium economy. However, economy seats are tighter and creampied comparing to a333 or a346 routing den-muc. Personal feel is that they are realy uncomfortable wiht less recline than mentioned aircrafrs. Missing 2-4-2 config wich is much better than 3-3-3. Bussiness seats ara standrad Lufthansa in 2-2-2 config. We have enjoyed flying the Boston-Munic route on the a340-600 with 2-4-2 economy class seating and downstairs restrooms. Unfortunately now replaced with the a350 with 3-3-3 seating. They have added one seat per row at a cost of comfort and convenience. Very uncomfortable flight. We will avoid this plane in the future. Our favorite airline is that no longer. Unbelievably uncomfortable. The extra leg room was good, but the seats are painfully narrow--in this case, made still worse by the in-arm tray tables. In addition, the seats are very thin and stiff, and the seat itself is shallower than normal. Neither of us is heavy or unfit, but we both were in pain by the time we arrived in Boston. We will NEVER fly this airplane again. 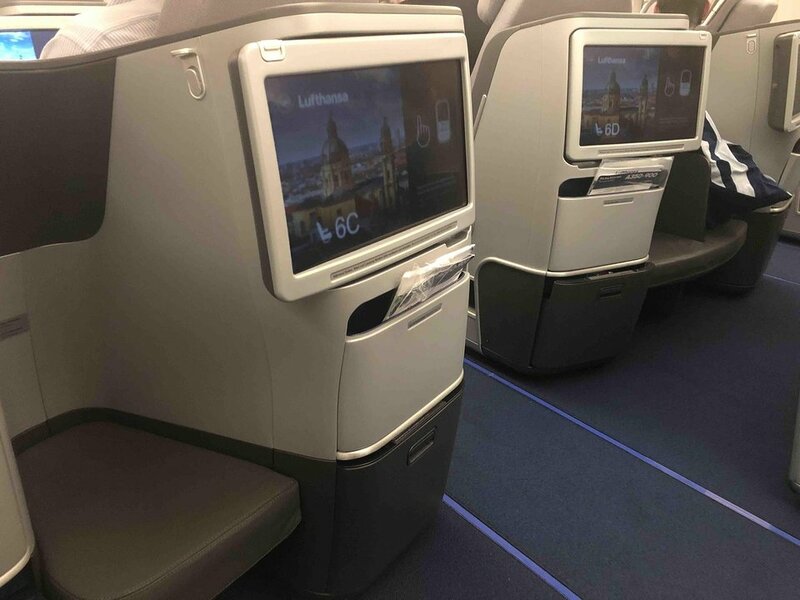 Lufthansa recently replaced the A340 with A350 on the Boston-Munich route. Economy class suffers by adding a third seat on each side and reduced legroom. A340 has 2-4-2 econ class seating vs 3-3-3. Very uncomfortable seating on A350. Overhead bin reserved for crew (emergency equipment). Seats 24E and row 25 also affected. The seat 41 H in the last row hat indeed limited recline because of the lavatory behind. But in case of reclining the seat will pushed in front. So if you are a tall person your knees will moved close to the seat in front of you. The right row in economy is mounted to the floor under the left and middle seat, so your feet will collide with the mounting. You will also find extra power outlet between the seats in front of you for you electronic devices. I didn't find it anywhere else in economy class in this A350! Lufthansa flies 2 versions of A350-900.